MANHATTAN, Kan. (AP) — Texas Tech coach Kliff Kingsbury spoke glowingly of the fan base at Kansas State, where no matter how much the Wildcats are winning or losing, they always seem to make it a tough road environment. The Red Raiders visit the Wildcats on Saturday, and the comments were striking given their loss to Texas last week. Thousands of fans left their home game in the third quarter, which has become all-too-common at Texas Tech, and missed a fourth-quarter rally that fell just short. 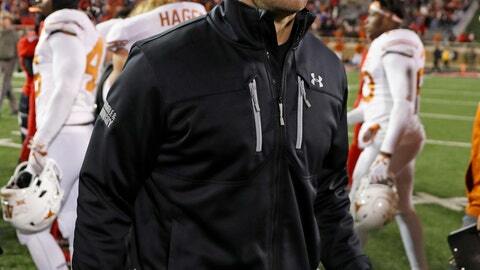 The comments raised some eyebrows around the program, particularly given Kingsbury’s increasingly tenuous situation. He arrived at Texas Tech as the golden boy-come-home, the star quarterback who had returned to Lubbock to help the program reach the same heights it did under Mike Leach. The Wildcats need to sweep their final two games against the Red Raiders and Iowa State, though, after losing close games to TCU, Baylor and Texas this season. And pressure is clearly mounting, with Kansas State not making any players available to media this week. That includes the 79-year-old Snyder, whom many are starting to believe will retire after the season. QB SITUATION: Texas Tech’s Alan Bowman is unlikely to play against the Wildcats, though Kingsbury didn’t rule him out early in the week. The freshman sustained a partially collapsed lung against West Virginia, then had a recurrence of the injury against Oklahoma. “We just want to make sure he’s healthy and forego another episode with that lung,” said Kingsbury, who will likely turn again to sophomore quarterback Jett Duffy for the third time this season. SPEAKING OF QBS: Alex Delton’s running ability saved the Wildcats last week against Kansas, but he’s been banged up for weeks. Fellow starter Skylar Thompson has also been dealing with injuries, forcing the Wildcats to contemplate using freshman John Holcombe in the remaining games.